After winter break, the girls at the very prestigious Longbourn Academy become obsessed with the prom. Lizzie Bennet, who attends Longbourn on a scholarship, isn't interested in designer dresses and expensive shoes, but her best friend, Jane, might be especially now that Charles Bingley is back from a semester in London. Lizzie is happy about her friend's burgeoning romance but less than impressed by Charles's friend, Will Darcy, who's snobby and pretentious. Darcy doesn't seem to like Lizzie either, but she assumes it's because her family doesn't have money. Clearly, Will Darcy is a pompous jerk -- so why does Lizzie find herself drawn to him anyway? Will Lizzie's pride and Will's prejudice keep them apart? Or are they a prom couple in the making? 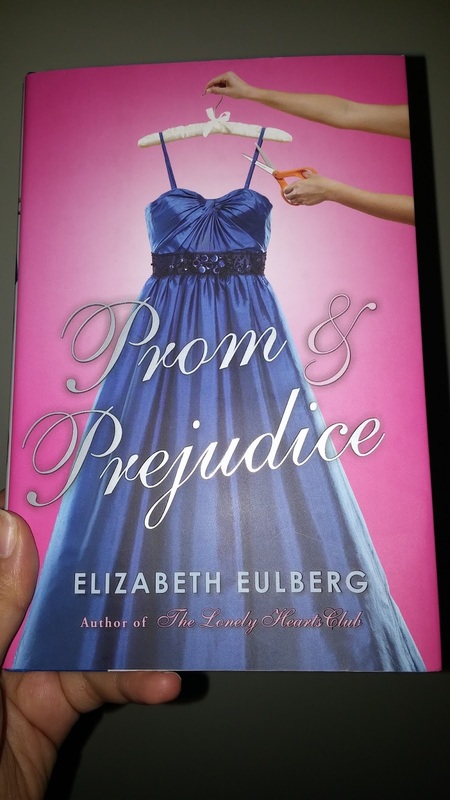 One of my favorite books is Pride and Prejudice, and I love the BBC mini-series, so when I saw that Prom and Prejudice offered to retell that story through teenagers, I ordered it and read it as soon as arrived. Lizzie Bennet is one of two scholarship kids going to an all-girl school. And because of being poor is harassed by the other students. So it's not surprise that she has no interest in any of the guys attending the nearby school for prestigious young men, Pemberley Academy - particularly the snobby Will Darcy. However, she does enjoy the company of his friend Charles Bingley and loves that her friendly roommate Jane has drawn his attention. At least Jane will be able to attend Prom with a decent guy. It doesn't take long for Charles' sister Caroline to ruin Jane's hopes for a prom date. While trying to help mend Jane's broken heart, Lizzie also has to fight the unwanted attention from Colin and the sudden stalking Will seems to be doing at the coffee shop she works at. Also we have the charming Wick that also dislikes Darcy and is very friendly with Lizzie who is in need of someone who relates to her situation. It's a predictable story but is well written, it's light and leaves a warm feeling in your heart. I recomend it for the Austen fans, for a light summer reading.